Macy's now offers a beauty box subscription, and I received the first one earlier this month. The beauty box will cost you $15.00 a month, and it always includes a $5.00 coupon that can be used on your next Macy's beauty purchase. 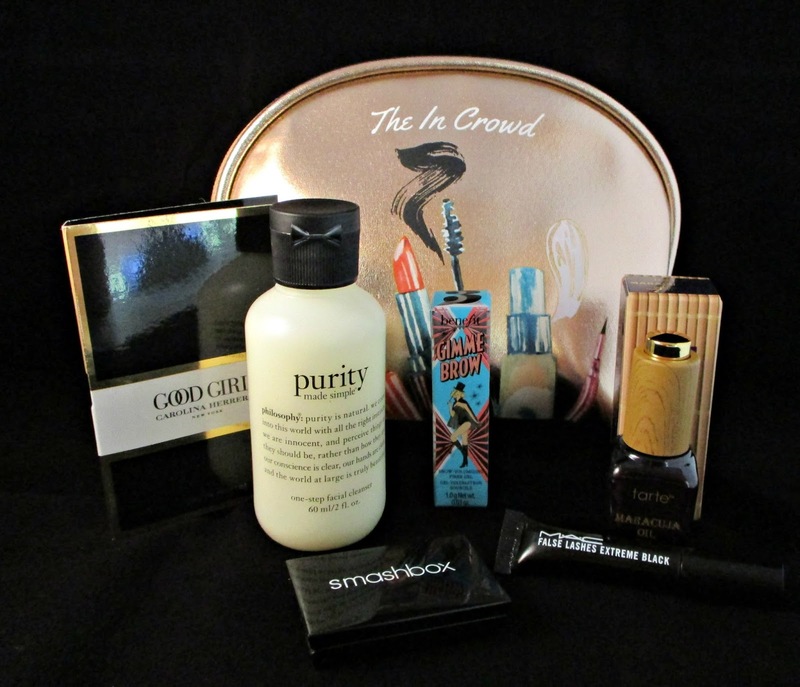 Each month you'll receive 5 deluxe samples plus one bonus, and some type of case or pouch. Here's a look at what was included in the August box. 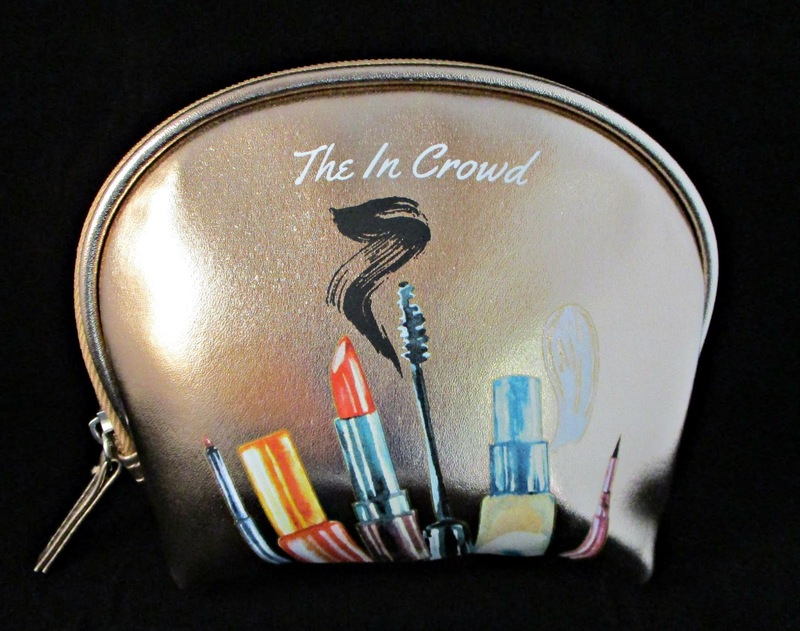 The items came in this cute make up bag, which I really like. It measures about 6" x 5", and seems to be well-made. The bottom is quite wide, so it's roomier than you'd think. The artwork makes this totally unique from any of my other bags. Inside the bag are 6 items--I'm not sure what their description of "5 deluxe samples + one bonus" means. The bonus might be the Smashbox shadow duo, because the booklet that came with the bag shows a picture of that, and mentions the "Full-size Palette in Golden Hour" next to it, which is a 6-color palette. At any rate, you get 6 items in the bag, none of which are full-sized. The items include: Tarte Maracuja Oil, MAC False Lashes Extreme Black Mascara, Smashbox Cover Shot Eye Shadow Due, Philosophy Purity Made Simple Cleanser, Benefit Cosmetics Gimme Brow Volumizing Fiber Gel, and a perfume vial of Carolina Herrera Good Girl. Above it a closer look at the Smashbox Shadow Duo. The booklet underneath contains a description of each item (sizes available, pricing and Macy's WedID number, should you wish to order something in full-size), and the $5.00 coupon on the back. 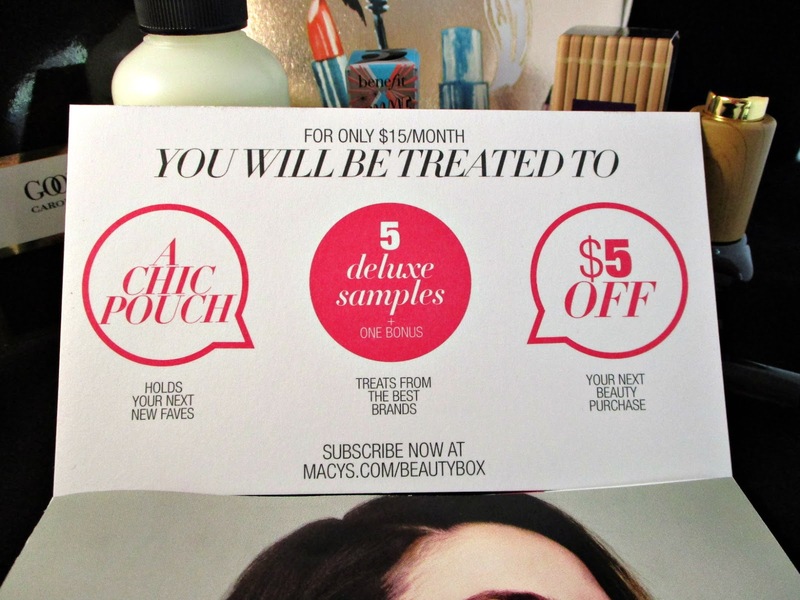 The basic information about the box is shown above, and you can find more information at Macys.com/beautybox. I'd have to say I'm feeling a little indifferent about this box, but I'm going to give it a few more months before I decide to keep it or cancel it. 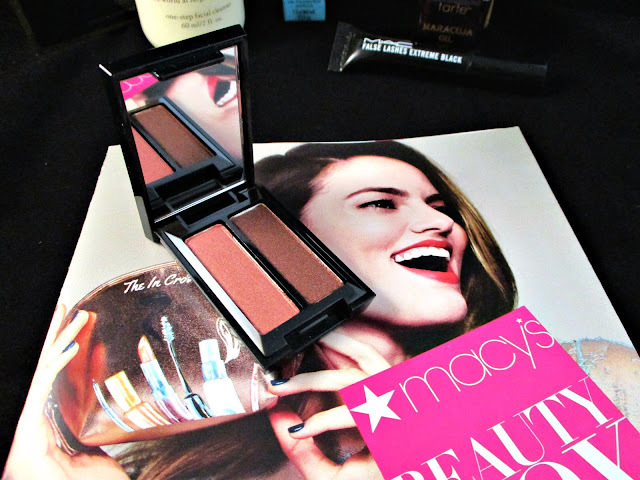 None of the products really wowed me, so to speak, and the $5.00 coupon will just enable me to spend more money!